Food tastes better when it's cute am I right? 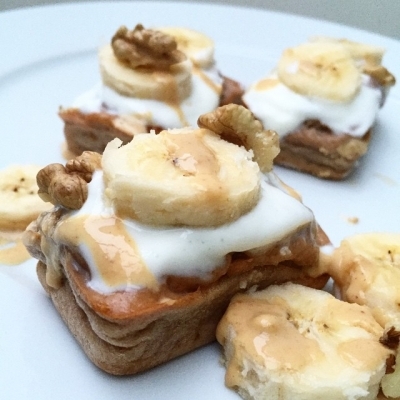 Makes 4 mini loaves but the macros are good enough to eat in one sitting! Combine kodiakcakes mix, egg white, almond/soy/cow milk, protein powder, 1/2 mashed banana (save the other half for toppings) , pb2 and baking powder into a medium sized bowl. Mix all ingredients together and evenly place batter into four mini loaf moulds. Bake for 20 mins at 350. Top with Greek yogurt, walnuts, more pb2 and bananas! Easy to take on the go as well if you're in a rush to get out the door!